Kama Dock is a Docking station for HDD / SSD. It features a stand function to hold up your HDD to four adjustable angles and a retractable stabilizer foot to balance the weight distribution for 3.5 inch (8,89 cm) drives. 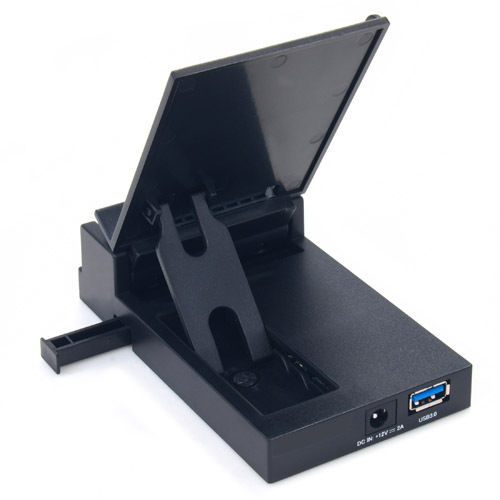 The docking station supports 3.5 inch (8.89 cm) as well as 2.5 inch (6.35 cm) HDD and SSD drives. Compatible Operating Systems are Windows 7, Vista, XP and Macintosh 10.2. Kama Dock is compatible with USB 3.0 to provide high data transfer rates. In caseDownward compatibility is provided for USB 2.0 and USB 1.1.